*This post contains affiliate links, which means if you click through and decide to make a purchase I may make a small commission. 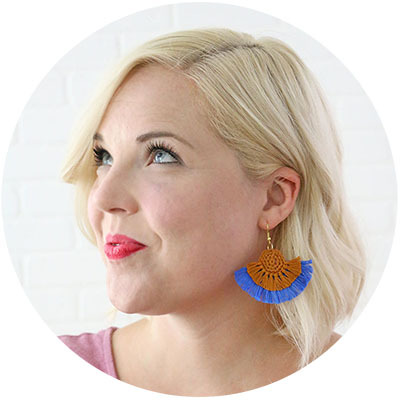 It doesn’t cost you anything extra and helps out Persia Lou, and don’t worry, I only link to products I use and love. Pineapples are a huge trend right now, and it’s one that I am totally on board with. 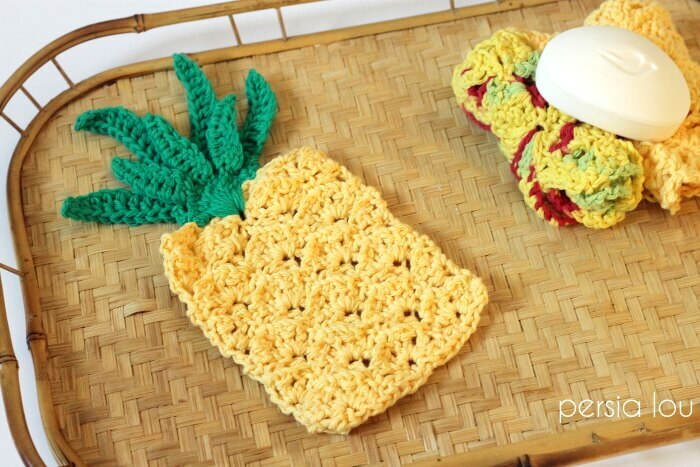 I’ve been wanting to make a cute pineapple project for a while now, and here it is: crochet pineapple washcloths! 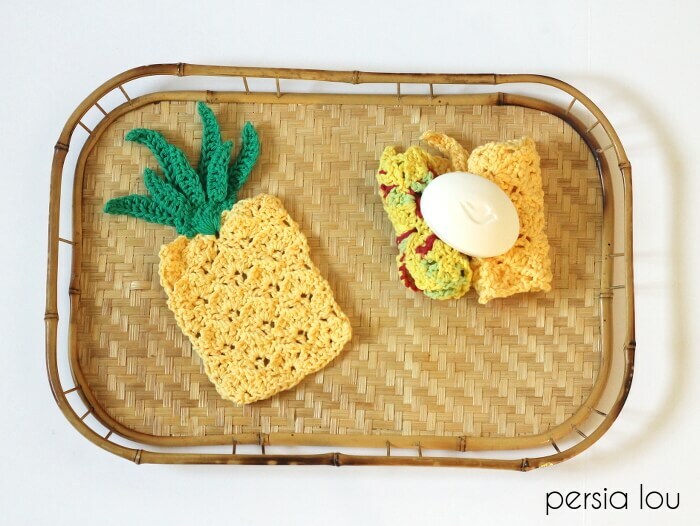 Washcloths are a perfect little crochet project because they work up quickly, but a simple square can be kind of boring – pineapple shaped washcloths to the rescue! 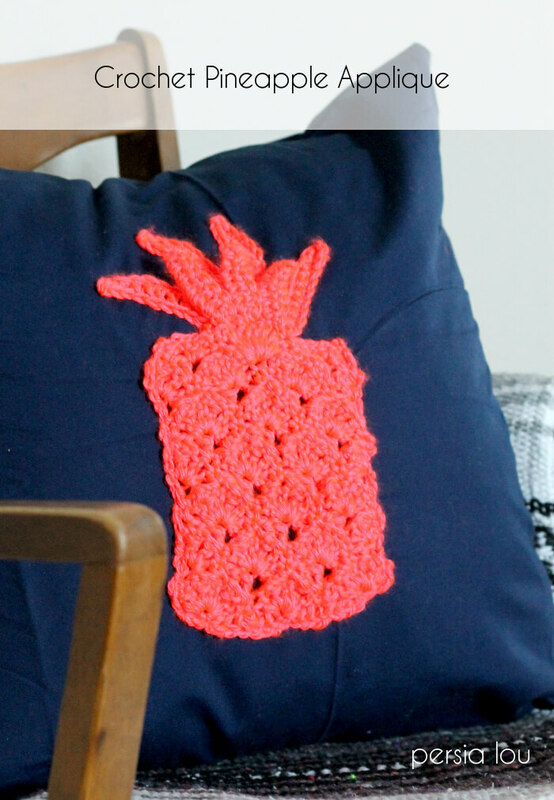 You can work up these pineapples in two-tones (with a different colored top) or in one solid color. 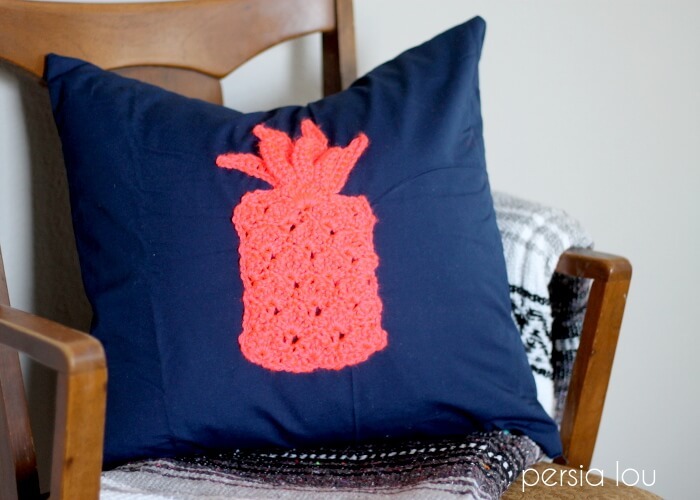 I think a few of these little guys would make an adorable gift, but if you don’t need a washcloth, this pattern can also be used to make a cute pineapple applique like the neon pink one I sewed onto a quick pillow cover. 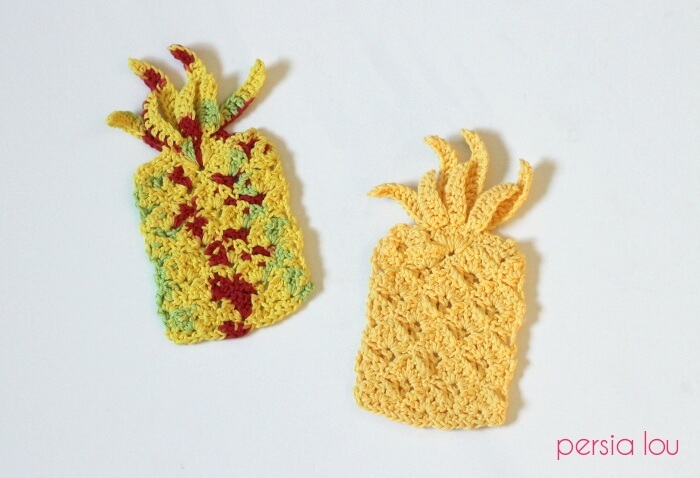 If you worked the pattern with a lighter weight yarn and smaller hook, you would end up with as smaller pineapple – lots of applique possibilities! 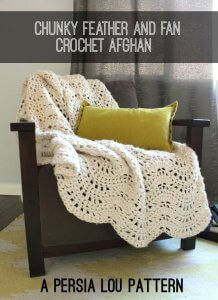 Ready to get crocheting and make your own? Let’s do it! Fan: In specified st work (dc, ch 1) 4 times, dc in same st (5 dc total): Fan made. 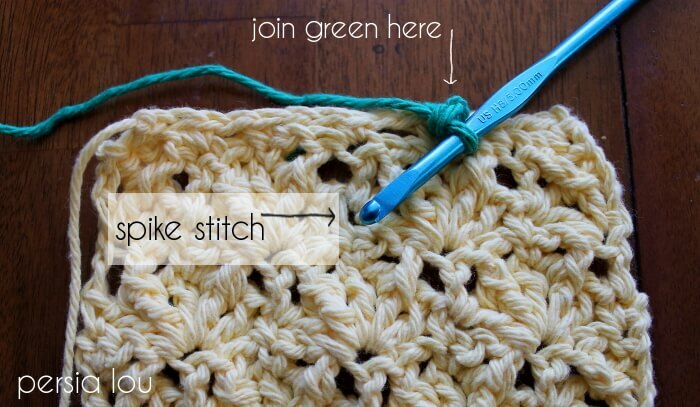 Back Post Double Crochet (BPdc): YO, insert hook from back to front to back around post (vertical bar) of specified st; YO and draw up a loop to height of a dc; YO and draw through two loops, YO and draw through both loops on hook: BPdc made. 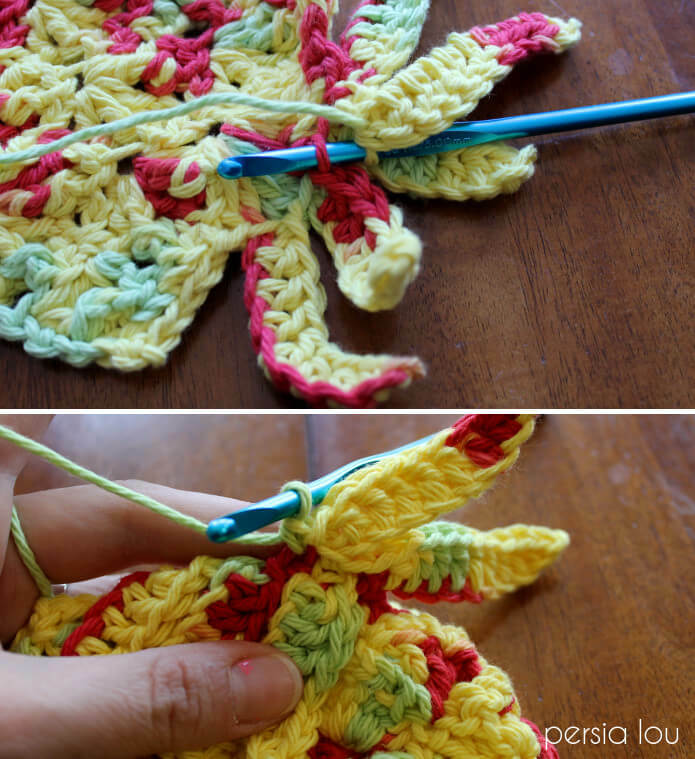 Spike Stitch Double Crochet (SSdc): Insert hook in st two rows directly below next stitch (or specified stitch) and draw up a long loop to height of current row; YO and draw through two loops, YO and draw through both loops on hook: SSdc made. Row 1: 19 fsc (see my tutorial for the fsc stitch here) OR ch 20, sc in first stitch from chain and in all remaining stitches, ch 1, turn. Row 2: sc in first stitch, skip 1 st, work Fan in next st, skip 2 sts, sc in next st; skip 3 sts, work Fan in next st; skip 3 sts, sc in next st; skip 2 sts, work Fan in next st; skip 1 st, sc in last st; ch 3 (counts as dc of next row), turn. Row 3: *BPdc around 2nd dc of next fan, ch 1, sc in next dc, ch 1, BPdc around next dc, dc in next sc; repeat from * twice; ch 4 (counts as dc and ch 1 sp), turn. Row 4: (dc, ch 1, dc) in base of ch; * sc in next sc, sk next st, work Fan in next dc; repeat from *across to last sc, sc in last sc, in top of turning chain work (dc, ch 1, dc, ch 1, dc); ch 1, turn. Row 5: sc in first dc, ch 1, BPdc around next dc; dc in next sc; *BPdc around 2nd dc of next fan, ch 1, sc in next dc, ch 1, BPdc around next dc, dc in next sc; repeat from * once; skip next dc, BPdc around next dc, ch 1 sc in third ch of turning ch; ch 1, turn. Row 6: sc in first sc; *skip next st, work Fan in next dc, sc in next sc; repeat from * across; ch 3, turn. Row 14: sc in first st; ch 2, skip next st, sc in next dc; ch2, sc in next sc; *2 SSdc in sc two rows below (see image below in two-toned pattern instructions); ch 8, sc in second ch from hook; hdc in next two chs; dc in remaining four chs; sl st in top of SSdc below (leaf formed); repeat from * twice, working all SSdc in same st; sc in next sc; ch 2, sk next st, sc in next dc; ch 2, sc in las sc; ch 1, turn. Row 15: sc in first st, (ch 1, sc in next sc) twice; sc in next two SSdc; ch 10, sc in second ch from hook; hdc in next two chs; dc in remaining six chs; sl st in top of sc at base of chain (leaf formed); *working behind leaves of previous row, sc in next two sts (see image below); ch 12, sc in second ch from hook; hdc in next two chs; dc in remaining eight chs; sl st in top of sc at base of chain (leaf formed); repeat from * once; working behind leaves of previous row, sc in next two sts; ch 10, sc in second ch from hook; hdc in next two chs; dc in remaining six chs; sl st in top of sc at base of chain (leaf formed); sc in next two SSDc, (ch 1, sc in next sc) twice. Finish off and weave in ends. Row 14: sc in first st; ch 1, skip next st, sc in next dc; ch 2, sc in next sc; (ch 2, skip next st, sc in next dc) twice; ch 1, skip next st, sc in next dc, ch 1, sc in last sc. Finish off and weave in ends. Row 1: With wrong side side facing you, join yarn in third sc from the right (see image below); * 2 SSdc in sc two rows below (see photo above in single color pattern); ch 8, sc in second ch from hook; hdc in next two chs; dc in remaining four chs; sl st in top of SSdc below (leaf formed); repeat from * twice, working all SSdc in same st; sc in third sc from left on previous row; ch1, turn. Row 2: sc in first sc, ch 10, sc in second ch from hook; hdc in next two chs; dc in remaining six chs; sl st in top of sc at base of chain (leaf formed); *working behind leaves of previous row, sc in next two sts (see image below); ch 12, sc in second ch from hook; hdc in next two chs; dc in remaining eight chs; sl st in top of sc at base of chain (leaf formed); repeat from * once; working behind leaves of previous row, sc in next two sts; ch 10, sc in second ch from hook; hdc in next two chs; dc in remaining six chs; sl st in top of sc at base of chain (leaf formed); sc in next sc. Finish off and weave in ends. And that’s it! 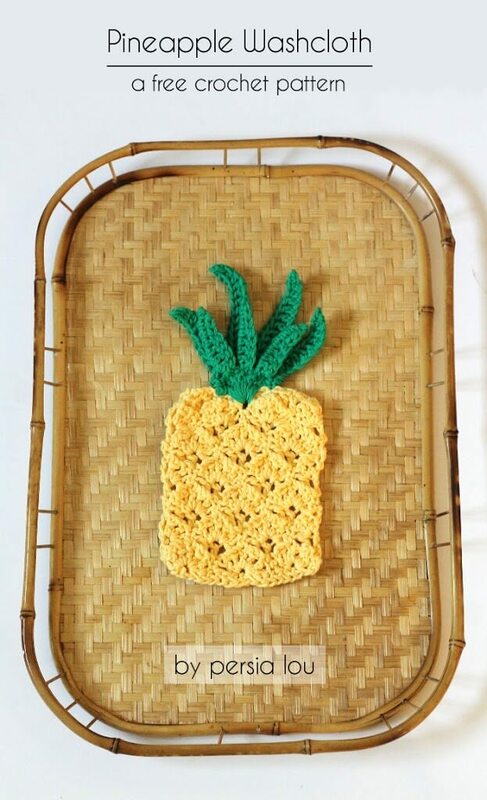 Enjoy your cute little pineapple! This pattern cannot be published, sold, or redistributed in any form. 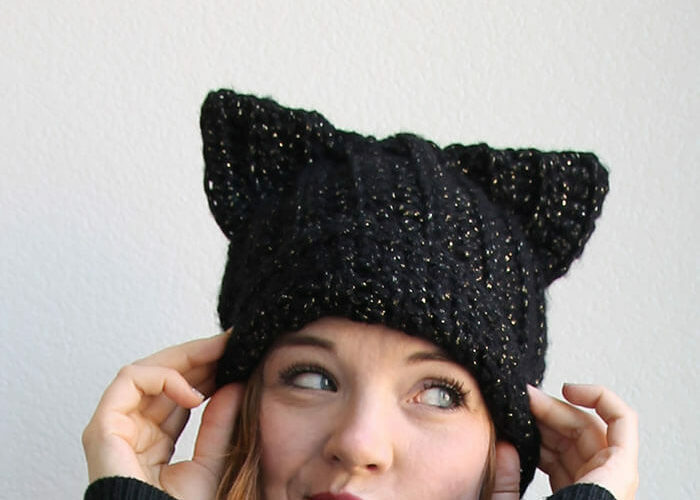 If you would like to share the pattern, please refer people to this page. 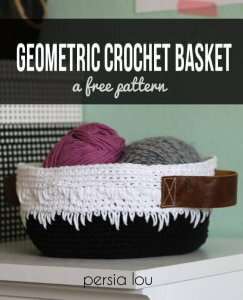 You may sell items made using this pattern as long as you link back to the pattern. Thank you! Goodness! I love the one on the pillow! Great job. Yes! 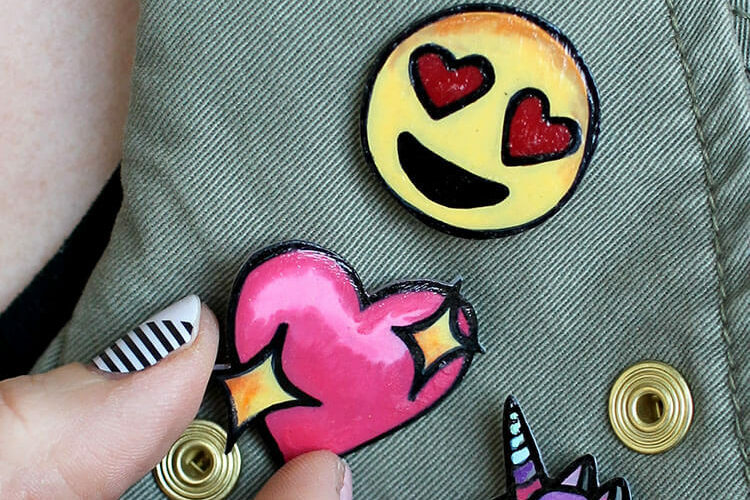 If it feels too flimsy to you, you could make two and then sew them together back to back. I would definitely use a cotton yarn. Good luck!